This weekend, I’m in the place I consider my second home: the town where I went to college. It’s Homecoming weekend, and only the second time we’ve traveled since both of us have had surgery. Traveling presents its own set of challenges–schedules aren’t rigid, there aren’t any food scales to weigh everything, and you’re at the mercy of others to prepare your meals. I don’t do protein shakes–I burned out on them pre-op and for the 3 weeks I was on full liquids. I know some folks still use them as meal replacements in their daily plan, but this is not something that is sustainable for me. Unlike most folks who have the sleeve, my drive to eat did not disappear entirely. I still feel physical hunger, even after taking Pepcid twice a day. I still get a pain in my stomach when it has been too long between meals. Mind you, the hunger isn’t as intense, but it is still present. It’s this hunger, coupled with the lack of structure that makes eating on the road a challenge. Today was no exception. Breakfast was what got me–I was too hungry and ate more than I should have, leaving me with half my calories for the rest of the day. I adjusted by skipping my midday snack, and choosing fish and veggies for my other two meals. I also climbed several flights of stairs today, which I don’t do with any regularity. After today though, I think I’ll start. My knees didn’t hurt and I wasn’t winded afterwards! I was pretty proud of that accomplishment. 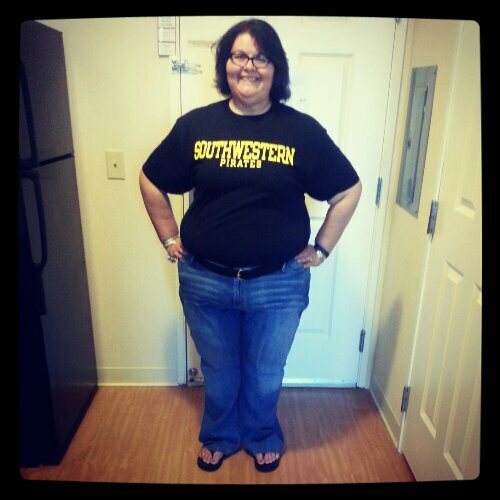 The thing that I am most proud and excited about is the fact that once we got to campus today, we went to the bookstore and I bought new logo clothing that is 2 sizes smaller. It’s trippy to think that four months ago, I was wearing a tight 3XL and 28W pants. Today I’m wearing an XL and a 24W–my hips are broad so I am pretty sure I won’t get too small there. 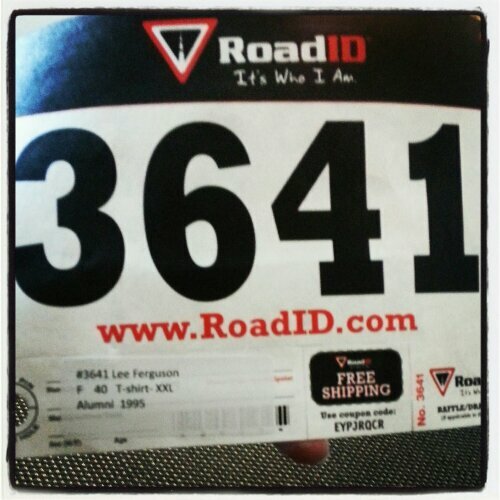 I picked up my bib this afternoon along with the race packet, which had coupons for free food at places around town. I chuckled about that, sensing the irony in a race giving away coupons for free ice cream and cupcakes. Today’s eating could have been better. Breakfast killed me today, and I know it. I could have made better choices but I’m not going to beat myself up over it. Tomorrow is a new day and another opportunity to improve and learn. Protein was good today: 95 grams. Fat was high though, 62 grams. I also ate a piece of toast today, which was good but won’t be something I make a habit. I did eat quite a lot of fish today since I knew it would be lower in calories. Since my breakfast was calorie dense I knew I had to budget tightly for the rest of the day. I did end up with leftovers at lunch and dinner so I have something to eat as a pre-walk meal. 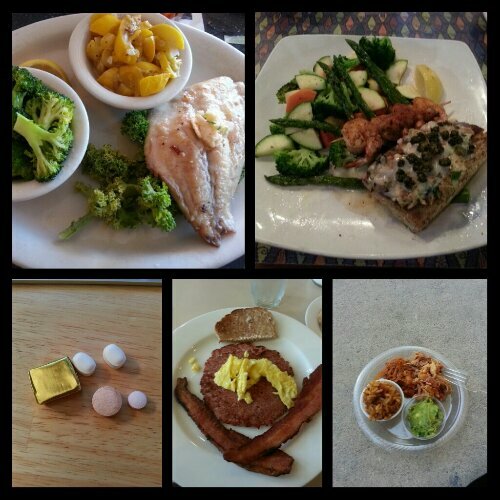 Today's food choices, from upper right: blackened mahi with lemon crab beurre blanc, grilled shrimp and steamed veggies; pulled pork and chicken, guacamole, and jambalaya (I tasted it but didn't end up eating it); multivitamin and calcium supplements x2, B12 and iron supplements; scrambled egg with corned beef hash, bacon strips and whole wheat toast; grilled Gulf drum with steamed broccoli and sauteed squash. Here’s to hoping I make a 25-minute mile tomorrow morning. My clothes are set out, my heart rate monitor is updated, and my iPod is loaded with a walking playlist that’s exactly 25 minutes long. This entry was posted in big things, challenges, daily bites, eating, goals, post-op, success, the sleeve, vsg, weight loss surgery and tagged aspiring runner, challenges, daily bites, eating, Jameson 5K, little celebrations, NSVs, post-op eating, post-op life, traveling, VSG, vsg realness, WLS. Bookmark the permalink. Thanks! 🙂 I am finally starting to see the fruits of my labor.